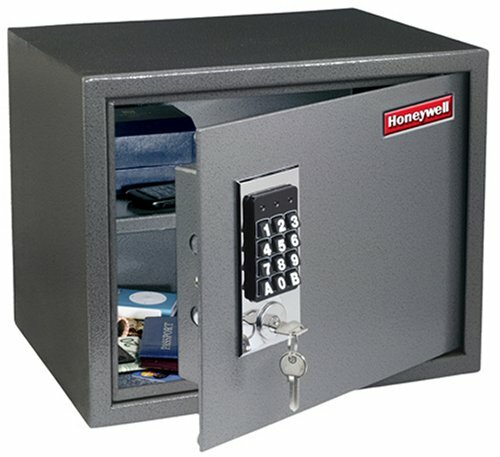 The Honeywell 2072 1.0-Cubic-Foot Anti-Theft Safe offers convenient protection for your valuables in case of burglary. It features an easy-to-operate digital keypad that can be programmed with the security code of your choice. This Anti-Theft Safe can save you money, protect priceless valuables, and help you avoid the hassle of replacing credit cards and important documents. 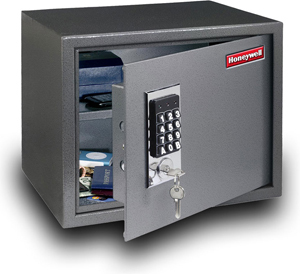 Honeywell Safes provide a wide range of protection options for your valuables. The Honeywell 2072 provides 1.0-cubic-foot of secure storage space for cash, important papers, small electronics, and other valuables. View larger. Featuring a dual digital and key lock, the Honeywell 2072 Safe is simple to set up and operate. Once you install the four included "AA" batteries, you'll be able to program the safe to open using any three-to-eight-digit passcode that you want. For added security after programming, opening the safe requires you to enter the code and insert one of the two traditional keys included with the safe. Red, yellow, and green LED lights guide you through the process. The safe is designed to lock-out the keypad if the wrong passcode is entered multiple times. A single override key that will open the safe without use of the passcode is also included, and use of this key is not affected by lock-out, so you're ensured access to your valuables even if you forget your code or the batteries in the keypad run out. Featuring solid steel construction, pry-resistant concealed hinges, and two live door bolts, the Honeywell 2072 Safe is crafted to provide years of dependable service. Designed with the ability to be bolted easily to the wall or the floor using the included mounting screws, it comes with instructions for simple do-it-yourself installation. This safe measures 12.13 x 14.56 x 9.75 inches (HxWxD) inside to deliver a capacity of 1.0 cubic feet. It measures 12.38 x 14.75 x 12.38 inches outside and weighs 36.1 pounds. The safe is backed by a five-year limited manufacturer warranty. SISCO entered the home and office security safe market over 30 years ago with the vision of a better product at a better value. The company grew to become the exclusive worldwide manufacturer and distributor of Honeywell safes. Backed by the security, comfort, and quality associated with the Honeywell name, these safes provide users with the best in-home and office security at a reasonable price. They provide customers with peace of mind associated with knowing that their valuables are well protected, thanks to the company's dedication to innovation, market research, and understanding of the needs of consumers. Honeywell 2072 1.0-Cubic-Foot Anti-Theft Safe, floor mat, removable shelf, mounting hardware, four "AA" batteries, two entry keys, and override key. This safe is what we were looking for. It's the right size for us and has a shelf for a price I was willing to pay for an anti-theft safe. It is not a fire safe. Arrived safely with no damage. Keys were where they should be and we had absolutely no trouble getting it open, installing the batteries for the keypad or setting a digital combination. It also comes with 2 'regular' keys, one of which is to be used in conjunction with the key-code to open the safe. After setting the key-code the first time, thereafter to open the safe, you must enter the key-code, make sure the key-code is accepted (beep!) and use a 'regular' key to physically turn the bolts within a time limit. There are 4 holes on the back (and I can't remember now, but I think there are ones on the bottom) to allow you to bolt it to a wall or the floor. It is small enough that having it door-forward on the floor makes it tricky to get your head low enough to see what's inside. I plan to bolt it to a wall once I find a good spot in our house, mainly to get it off the ground so I can see into it. There is a tiny light on the edge of the door that you can turn on when the door is open to shine into the safe. Might be useful in a totally dark room, but I haven't used it. All-in-all, we've been happy with it. Have had it since 3/2007. Manufacturer web site it http://www.honeywellsafes.com aka SISCOproducts. This is a fantastic value for the money -- as long as you're looking for a non-fire rate safe. After many episodes of watching "It takes a Thief" on television (which makes me now a high-trained security specialist [not]), I realize that most burglars are looking for a quick in-and-out. Most of the time, the thief is out within 15 minutes. I have a house burglar alarm and doubt that the Company would arrive within 15 minutes, so it makes sense that a thief would want to get in and out quickly. This safe will definitely slow someone down, especially when bolted down. The steel isn't particular thick but it would still take several minutes with a sledgehammer (if the thief brought one) or with a blow-torch to open it -- and it's unlikely that they'll take the time. They'd rather walk-off with the safe itself, so bolt it down well and hide your crowbars in your basement. This safe is large enough to store all my valuables such as my passports, etc. and even some of my cameras. It's convenient enough that I actually use it -- unlike other combination lock safes that I've had. And the master key means that even if I forget the combo or lose the regular key, I can still open it. The master key is kept in a safe place off-site. So, buy this, bolt it down as firmly as you can, and enjoy! I found this safe easy to program the keypad and operate. It is very spacious and works well as a gun safe. I highly recommend this product. 1. The safe includes two types of keys. A master key that allows you to unlock the safe even without knowing the keypad code. Sure, this represents a security issue, however, simply put: hide this key! Security issue resolved. 2. If placed on wood floors it will probably scratch them. I recommend you purchase felt or rubber bottom stick-its (the same ones for the legs of your furniture). This will solve the problem of scratching your floors. Substandar product. Fails to deliver. This item is a great value for the money. It is not fire resistant, but is not supposed to be. It is used as a gun safe, and fits the bill better than many gun specific safes. It has plenty of room, and a solid feel. The only thing I don't really like is the key system. I'd rather have a digital only lock, like the hotel safe we used on holiday. The code was whatever you chose at the time, so it could be changed daily, if desired. With this safe, you have to use both the digital keypad, and a key. Also, you have to hide (and remember where), a master key.